To find where to plug the Hum device into in your vehicle, view this info. The On-Board Diagnostics II (OBD-II) port is used to access the vehicle's computer for various tasks, such as emissions tests and diagnostics. The OBD-II port is where the Hum System is installed so that the network can communicate with the vehicle directly. After activation, the vehicle owner receives an alert email if the OBD reader has been plugged back in after being unplugged from the port. For additional assistance in locating your particular model vehicle's OBD port, consult the OBD locator. 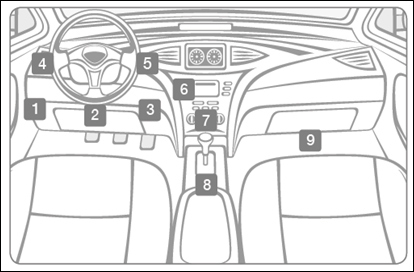 The OBD-II port is usually located under the dashboard, beneath the steering wheel column (1 - 3 in the diagram below). If not located beneath the steering column, look for the port in the areas indicated by numbers 4 - 9.